Kabob Curry of India specializes in Northern Indian cuisine. I had to look up what “Northern” Indian food was and found that North India has an abundance of fresh seasonal fruit and vegetable because of its geographical position with relation to the rest of the Sub-continent. That means that this region of the country has had strong Central Asian influences both in its culture and its food. The style of curries usually have thick, moderately spicy and creamy gravies. The use of dried fruits and nuts is fairly common even in everyday foods, and dairy product like milk, cream, cottage cheese, ghee (clarified butter) and yoghurt play an important role in the cooking of both savory and sweet dishes. Even though this place has been here for years, we came here on a Friday night and the place wasn’t very busy. I think most people must take their food to go, as the man who greeted me asked if I was here to “pick up”. During the week, they offer a lunch buffet from 11:30-2:30, and a champagne brunch on Saturdays, as well as local delivery service. 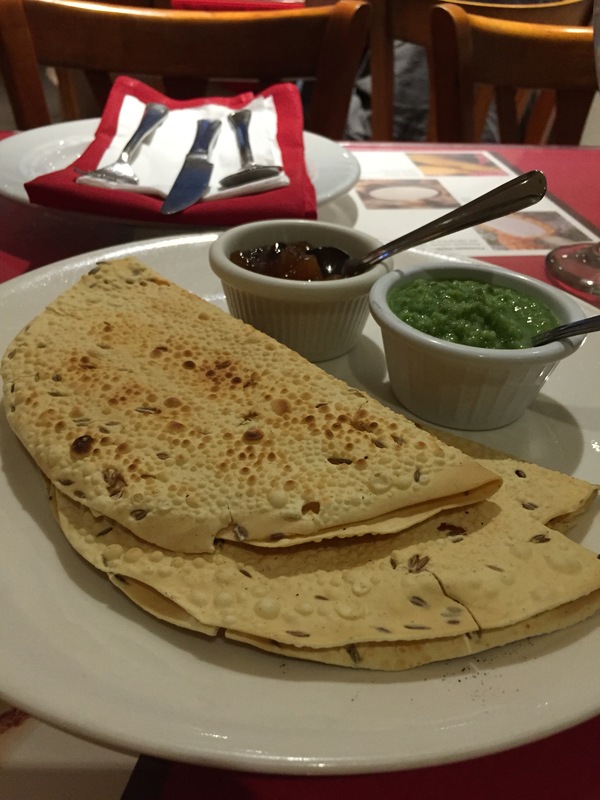 While going through the menu, an order of papadum was placed on the table. Papadum are crisp lentil crackers that are slightly spiced, and typically served as an appetizer or snack. Chickpeas is another ingredient that can be used, and served on the side were a tamarind and mint chutney sauce. – Plain Basmati rice, which is a long, slender grain aromatic rice commonly used in Indian and Middle Eastern cuisine. The food was very good, and it was even nicer that we had a Groupon to use. With the discount, our balance for dinner was less than $4. We added a generous tip, and still saved money on a great meal.